Dougie Imrie's 78th-minute strike meant Morton dealt Dundee a huge blow in their bid to win the Championship. Imrie rifled home Rowan Vine's cutback into the far corner to give the Cappielow side only their sixth league win of the season. Dundee will feel aggrieved given they dominated the match, winning 13 corners in the first half alone. Former Ton striker Peter MacDonald and Christian Nade were guilty of missing chances for the visitors. Paul Hartley's men now drop to second, a point behind Hamilton Accies with two games to play. Third-placed Falkirk are also still in the mix, just a point behind Dundee. For Morton, it was some much needed joy in a dismal season. This exact time last year, they were in second place on 67 points. Now, already relegated, this win has just taken them beyond a third of that total. Nicky Riley and MacDonald were chief tormentors in a first half that yielded so many corners for Dundee, although only one or two of those threatened to bring the opening goal. The fact MacDonald was so central to Dundee's attacking play would have been hard for home fans to watch; the 33-year-old notched 15 goals for Morton last season when they finished second in the league. MacDonald went close with a header and also watched his left-foot angled drive saved well by the foot of Ton goalkeeper Derek Gaston, but Dundee fans sitting behind the goal might have been frustrated their team did not raise the tempo further. 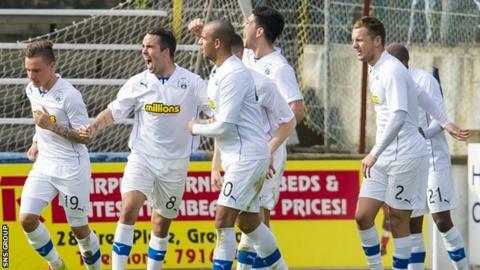 It meant Morton, through Vine, nearly scored against the run of play on 35 minutes. However, his 12-yard effort from Fouad Bachirou's pass was comfortably over Kyle Letheren's crossbar. Dundee began the second half flying, MacDonald again being presented with an opportunity from six yards that Gaston kept out. When Nade went clear through the very decent turnout of away fans thought it was the moment they would go in front. However, the former Hearts man shot a whisker wide and the frustration continued. Things got worse for the Dark Blues when former Hamilton forward Imrie finished clinically following extremely good work by Vine down the right. Letheren ensured the lead remained at one, denying Fouad Bachirou after a Morton counter-attack as Dundee tried, and failed, to equalise. Match ends, Morton 1, Dundee 0. Second Half ends, Morton 1, Dundee 0. Foul by Jim McAlister (Dundee). David Robertson (Morton) wins a free kick in the defensive half. Substitution, Morton. David McNeil replaces Barrie McKay. Corner, Dundee. Conceded by Stuart Findlay. Attempt blocked. Peter MacDonald (Dundee) right footed shot from outside the box is blocked. Nicholas Riley (Dundee) wins a free kick in the defensive half. Corner, Dundee. Conceded by Thomas O'Ware. Substitution, Morton. Archie Campbell replaces Rowan Vine. Corner, Morton. Conceded by Kyle Letheren. Attempt saved. Fouad Bachirou (Morton) right footed shot from the centre of the box is saved in the top left corner. Substitution, Dundee. Craig Beattie replaces Cameron Kerr. Attempt missed. Christian Nade (Dundee) left footed shot from the centre of the box is high and wide to the right. Foul by Scott Taggart (Morton). Christian Nade (Dundee) wins a free kick in the defensive half. Goal! Morton 1, Dundee 0. Dougie Imrie (Morton) left footed shot from the centre of the box to the top left corner. Assisted by Rowan Vine with a cross. Attempt missed. Fouad Bachirou (Morton) right footed shot from the centre of the box misses to the right. Foul by Declan Gallagher (Dundee). Rowan Vine (Morton) wins a free kick in the defensive half. Gavin Rae (Dundee) is shown the yellow card. Dougie Imrie (Morton) wins a free kick in the attacking half. Foul by Gavin Rae (Dundee). Stuart Findlay (Morton) is shown the yellow card. Foul by Stuart Findlay (Morton). Attempt missed. Dougie Imrie (Morton) left footed shot from outside the box is close, but misses to the left. Substitution, Morton. Nicolas Caraux replaces Derek Gaston because of an injury. Attempt missed. Christian Nade (Dundee) left footed shot from the centre of the box is close, but misses to the left. Attempt missed. Christian Nade (Dundee) right footed shot from outside the box is too high. Cameron Kerr (Dundee) wins a free kick in the defensive half. Foul by David Robertson (Morton). Substitution, Dundee. Christian Nade replaces Craig Wighton. Hand ball by Nicholas Riley (Dundee). Attempt missed. Martin Boyle (Dundee) right footed shot from outside the box is close, but misses to the left. Attempt saved. Peter MacDonald (Dundee) right footed shot from the centre of the box is saved in the centre of the goal. Corner, Dundee. Conceded by Derek Gaston.